It may seem counter-intuitive that a couple who values privacy would choose an RV resort for their vacation home. 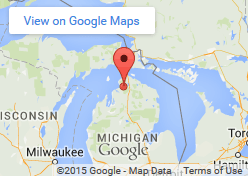 That seems especially true when that resort is notable for the friendliness and sociability of its owners. But for Dan and Lorri Cheresh of Saugatuck, Michigan, Petoskey’s Hearthside Grove Resort has been a perfect fit for their under-the-radar personalities and low-key lifestyle. And for that, they credit landscape design experts like David Hoffman, who transformed their two lots (one purchased for a simple privacy buffer) into a sanctuary retreat. Hoffman’s first landscaping phase hid the bungalow, creating a privacy screen, but also leaving open peeks of the impressive rock work along with the stream that flowed into the larger resort pond as well as “viewing windows” that gave the couple glimpses of features like crackling fires on adjacent lots. When the couple added an outdoor kitchen and pergola, Hoffman extended the landscaping to offer privacy there but adding a welcoming walk- way for when the couple did have time for guests. Dan still works, sometimes from the motorcoach or bungalow, running the busy tech company he founded, and he often flies to sailboat races as a member of a world-class sailing team. Both keep busy with their combined nine children and nine grandchildren, and the close family was considered in every stage of lot development. 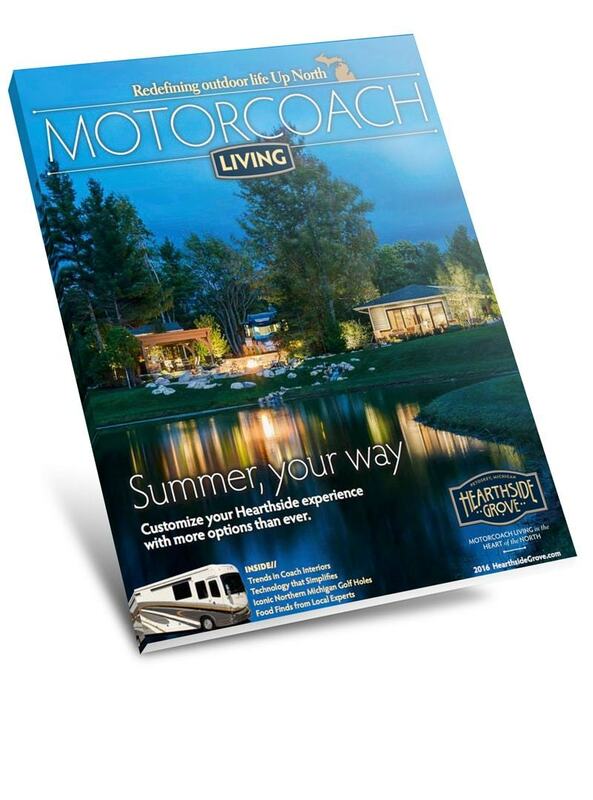 Originally, however, the only thing in their Hearthside Grove plan was a quick weekend getaway in the fall of 2013, on their first outing in their first motorcoach. They passed Lot 145 on a tour of the resort the following day, and they were sold. They decided to just buy a pad for parking the coach. By January, that had morphed into an additional bungalow, which evolved into a pergola, outdoor kitchen, water feature and more landscaping. Within the bungalow’s 192 square feet, they’ve also included a queen-sized sleeper sofa, 44-inch television above a gas fireplace and stunning tiled bathroom. The barn wood floors are a nod to their love of horses, and even the tiling carries through the color scheme of mustard yellow, cream and brown. The effect of it all is a sense of oasis, the couple says. 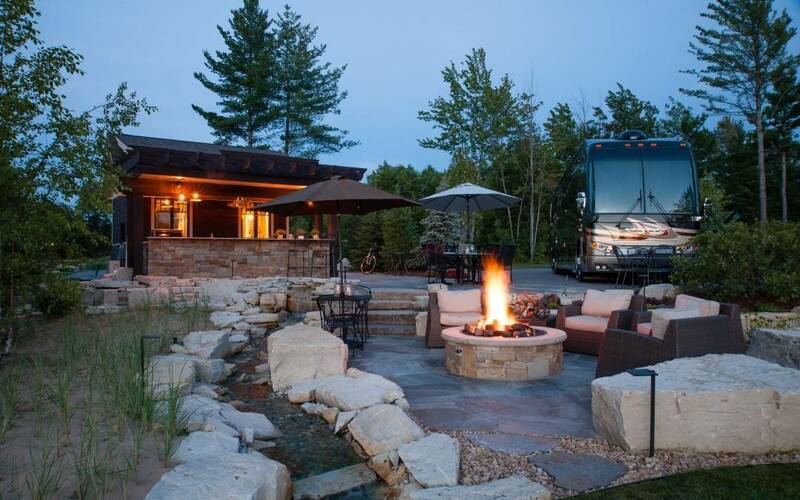 If this sounds like the luxury RV lifestyle that you’ve been seeking in peaceful and picturesque Petoskey, MI., then we welcome you to join us here at Hearthside Grove. There’s a perfect lot just waiting for you to build your dreams upon!